Alert! Publishing company StoryAfrica – which doesn’t seem to have a website, but whose founder, Mfonobong Nsehe, has an underused Twitter account – has published the first of many planned volumes of “Africa’s best short stories”, featuring, if the blurb is to be taken at face value, Chimamanda Ngozi Adichie, Wole Soyinka, EC Osondu, Chika Unigwe, Jude Dibia “and the rest of the stars”. BOOK SA, on the other hand, smells a big, fat, hairy rat. In fact, BOOK SA thinks that Africa’s Best Stories Vol 1 might be a literary 419 scam that could land its creator in hot water. Africa’s Best Stories was published using Amazon.com’s in-house self-publishing service, CreateSpace. It’s doubtful in the extreme that any of the writers listed above would participate in a publishing venture founded on such an obscure platform – even if the mover and shaker behind it was a “Publishing executive. Media Visionary. Dreamer. Drummer. Global citizen” – as Nsehe describes himself on his Twitter page. Amazon.com has published, “Africa’s Best Stories.” The book is available on Amazon.com. The book contains 16 stories and 2 poems by Afric’s best renowned and upcoming writers. The stories in the book were taken through a rigorous selection process by a panel of over 20 literary scholars and professors in Harvard, Columbia and Yale. Out of 120 stories voted for this anthology, the 18 best were published in a book. Two results! Almost a Googlewhack! Oprah Winfrey and the Oprah Book club have endorsed a new book, ‘Africa’s Best Stories’ as the Oprah book club pick for 2010. 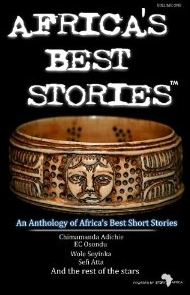 Africa’s best stories is a collection of the very best short stories written by Africa’s best and finest writers. Some of the writers featured in the anthology include Nobel Prize laureate, Wole Soyinka, Orange Prize winner, Chimamanda Adichie, Caine Prize finalists, Sefi Atta, Chika Unigwe, EC Osondu, and Duchess Lilian Koki among several other budding writers. Some of the stories included in the book include Why husbands who love their BMWs should avoid High hairstyles by Muthoni Garland, The Guitar by Kingwa Kamencu, The Time Story by Chimamanda Adichie, A place called hope by Jude Dibia and Borrowed Smile by Chika Unigwe. The 18 stories in the book were selected after a rigorous process by a panel of over 20 literary scholars and professors in Harvard, Columbia and Yale. The Oprah Book club said, ‘Africa’s best stories is a refreshing read. Indeed, Africa’s got some really gifted storytellers. We love how African culture was distinctively brought out in these stories. African literature is the future,’ Oprah said. Africa’s Best Stories is available for sale on Amazon.com. 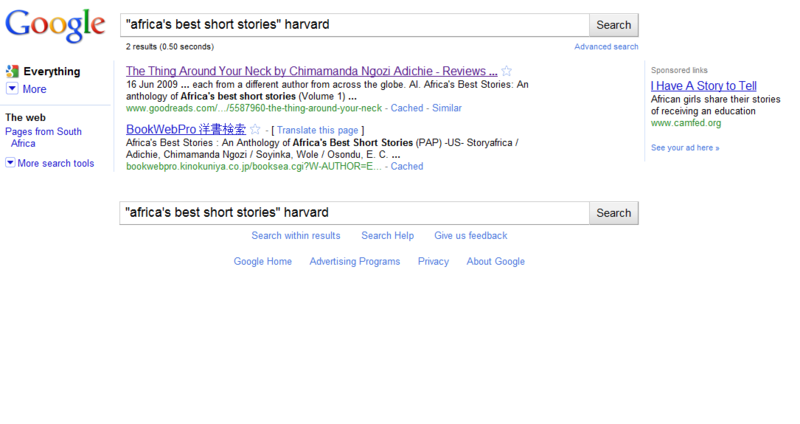 Hmmm, all the results appear to be be unrelated to Africa’s Best Stories. Searches for other keywords, meanwhile – like “StoryAfrica”, or “Mfonobong Nsehe” – turn up nix, nada, nothin’. The book retails for $20 on Amazon, meaning that if Nsehe’s scheme takes off, he’ll make a tidy sum out of his “associations” with Amazon and Oprah. Implication: Africa’s top writers are actively involved with this book. Likely reality: Their works have been stolen for someone else’s profit, and they should get on the phone to their agents immediately. Insinuation: Amazon.com is involved with this book. Likely reality: Amazon’s got nothing to do with it, apart from providing the infrastructure to create and sell it. 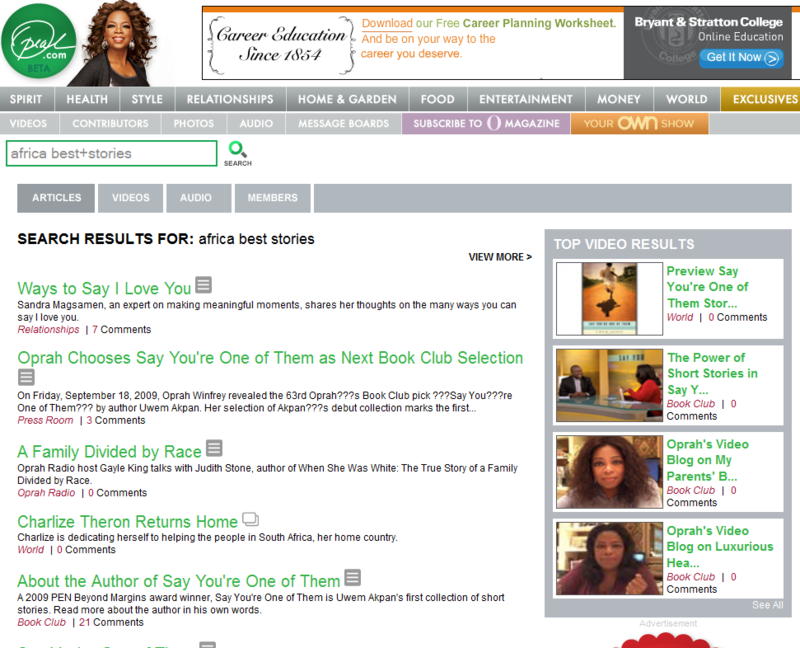 Claim: Africa’s Best Stories has gained Oprah’s notice and she’s adopted it for her book club. Likely reality: The association with Oprah was opportunistically concocted in the wake of Uwem Akpan’s success. Someone needs to drum this gent out of the business before Africa’s Best Stories Vol 2 appears! Wow, that's some seriously scary stuff! Can't believe this kind of thing happens. This guy has got one big pair of cahones! I'm somewhat embarrassed by how gullibly I've been following this rake's progress on Facebook. The Oprah thing did raise a slight blip in my social-media-induced ADHD brain. But all I thought was, "Oprah again? Really? Oh well, I guess this news will be on twitter and Book SA as well then." Hello. My name is Mfonobong Nsehe, and I write on behalf of StoryAfrica where I am the lead editor. I discovered that you are now following me on Twitter. Thanks. My attention was drawn to your article, ' Meet a Literary 419 scam: Africa's Best Stories involved in Oprah Book Club Hoax' in your highly trafficked website, www.books.co.za. I was shocked at one hand, but on the other hand, I was damn excited. Truth is, StoryAfrica is not a hoax. It is not a scam either. StoryAfrica is the brain child of a group of literature enthusiasts from Daystar University, Kenya. We are all students. We love African literature passionately, and our dream is just to showcase the best of African literature to the rest of the world- especially the Americas and Europe. We discovered that Africans read a lot of American literature, but Americans do not read as much of our literature. We just want that to change. We want America and Europe to get a feel of our literature. All we want to do is to promote African writers, and so during one of our brainstorming sessions, we decided to come up with a quarterly publication that will document some really amazing literature from amazing African writers. We came up with Africa's Best Stories. Contrary to what you wrote in your article, WE ACTUALLY REQUESTED PERMISSION FROM ALL the writers featured in the book for the permission to reprint their stories. Every writer featured in the book has a marketing byline beneath their story, which we hope will move readers to purchase their books. That is how we intend to promote these writers. When we published the book, we had a challenge of getting the word out to the world. Since we are students and experienced great difficulty in raising funds to market this book, we decided to market online. As you know, the online marketplace is overcrowded, and so we had to get creative with generating publicity since we could not raise a dime to hire a professional PR company. One of us suggested that we attempt 'Oprah Power' to generate publicity. We were not sure it would work out, and so we carefully crafted a Press release and sent to some sites. It was published, and people actually taught Oprah endorsed it. Our aim was just to generate some cheap publicity. It worked out, apparently. We made it to the front page of your website! You've blessed us. However, I understand that people have been falsely led by this information. On behalf of the StoryAfrica team, we are truly, very, very sorry for the false information. We sincerely are, and I hope you will forgive us. All we wanted was some publicity, and I guess we made an unwise decision by toying with the name of Oprah. We sincerely regret our actions, and we take responsibility for them. If Oprah gets to read this, we are sorry. Also, I need you to know that the book is NOT a for-profit venture. You may not believe this, but it is true. We sell the book for $20, and EVERY single profit we make on the sales of these books is going to 10 carefully selected charities in Nigeria, Kenya, Ghana, Cameroon and Zambia (the countries where our writer-contributors hail from). 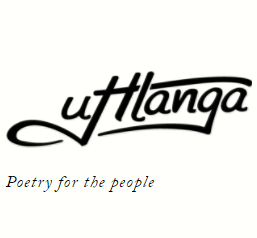 Our idea was that every quarter, we would publish new anthologies and distribute the funds realized to poor schools in the countries where our contributors hail from, while promoting good African literature to the world. I do hope you understand. We are not scammers or 419ners. We are sincere people just pursuing a noble cause. We are serious about StoryAfrica, and we purchased a domain name, www.storyafrica.com, and we are working on our website. I’m sending you this email through my StoryAfrica email address, Mfonobong@storyafrica.com. Our dream is just to sell African literature to the world and to contribute our own quota to African education while doing so. We have started a counter-campaign titled, ‘Oprah did not endorse ‘Africa’s Best Stories, but it is a great book still.’ We will make restitution for our actions. We are not bad people. I just hope you will tell your readers this. I look forward to talking some more. The question, Mfonobong, is whether you received permission from the writers to publish their work. If you didn't, then your project is fraudulent and illegal, and you should (a) stop it immediately by withdrawing the book from Amazon; (b) apologise to the writers whose work you stole; (c) pay over any monies received to them as compensation (not to the charities); and (d) pray they don't take legal action against you. If you didn't seem so hopelessly ignorant, there would be a good case for branding you and your cohorts as lazy liars and counterfeits. Please spare other African writers out there the worry that you might publish a second volume in this series and assure us it won't happen. "You are absolutely right about this as a 419 scam. This fellow never had my permission to use my story. I did send him an email and he sent back a mealy-mouthed response." "I was told by one of our students working on this StoryAfrica project that she had contacted the Caine foundation and requested them for your permission to use the story and your name. "We had done this since April last year. She had given me the impression that the foundation had accepted. It was even after we had the impression that we had been given the rights to use the story that I found you on Facebook and sent you a friend request. "I'm so sorry to know that you were not consulted. I'm merely the editor of the anthology, and there was a lady who was supposed to get permissions for all the stories featured in this book. "Apparently, she did a very poor job. I regret that terribly. Sincerely." And so it goes on. A very poor show indeed. Good to see that notice of this scam is now on Amazon. Unfortunately the book is still for sale! BTW, Oprah has a strong lock-down on any info relating to her chosen books. No one, not even a publisher or author, is allowed to say anything about an Oprah endorsement before Oprah goes public. The fact that StoryAfrica was claiming an Oprah endorsement before one had heard the news from the Winfrey herself was amateurish on their side, and clear evidence of a scam. Mmm, the link, www.storyafrica.com, that Mr Nsehe provides is a domain registered in his name as well as StoryAfrica Inc, but address shown as Daystar University. The URL, www.storyafrica.com resolves to the non-existent blog at http://www.storyafrica1.blogspot.com/ though. I would also suggest that those with Amazon accounts give the book a 1-star review, give a brief summary of the problem, and point the review to the scam article. The 1-star review tactic is often very effective as a protest measure. Whatever. I bought the book and it's a great book. i ABSOLUTELY loved it. That's the issue. He should solve whatever copyright issue he has with the owners and leave the book up for sale. There were many really nice stories in the book. That's my thinking. But it is no big deal. Books.co.za, stop hating on this guy. I feel like u guys are envious that his book is selling. What if he is really giving the money to charity? I read his letter and I sa that you guys are even following him on Twitter. Wtf? paulmitchell, would you be able to post the book's table of contents here? That would be very interesting to see. As for your support for the project, I think you're radically off-base. The group that published the book stole the work and lied about the product. Those are both pretty terrible things to do. I won't go into how difficult it would be to "solve whatever copyright issues" now confront the publishers, but to imply that it would be an easy matter to undo what's been done, and still keep the book in print, seems a bit disingenuous. It's not that we're "hating on" the StoryAfrica group, it's that they committed fraud and it urgently needed pointing out. Our site is dedicated to promoting the sale of books from Africa, so if this one were legit we'd be overjoyed at hearing about how well it's doing in the marketplace. A very different story from this one would result. Last, we're following Mfonobong on Twitter for reasons I thought would be pretty obvious. Aren't they? Shew - I'm late on this but found it thrilling. Nice work, Ben. If I were Mr Nsehe, I'd be very scared of litigation by Oprah. She could leave him naked on the gutter outside the university. Sigh. Someone else who doesn't get that stealing people's work is, er, stealing. Buying a book with stolen content is exactly the same thing as buying "hot" goods from a fence -- sure, you may love your new flatscreen TV, and your neighbours may be envious, but the bottom line is that you were accessory to a crime. OK, the argument goes, it's a bloodless crime. But if you worked hard all month and found that someone had stolen your salary at the end of it, with no hope of getting it back, you'd be pretty pissed. And you wouldn't be comforted when the thief announced that he'd only stolen your salary to give it to charity. That's exactly how writers feel when their work gets pinched. Whatever. You guys are making a big deal of this thing. All the stories in the book are stories that have been published on the internet. For free. It's not like the writers were going to make any money off the stories. I've looked at all the stories on the internet, and they are all posted there. Free stuff. This good group, led my Mr. Nsehe just decided to select the very best of these stories, and put them in a book format for the world. You guys are blowing it all out of proportion. I found some of the stories in the book on Guernica magazine- for free! Tell me how the original writers were going to make money off them in the first place. It's not you can sell single stories to the world in book format. I don't know why I'm defending StoryAfrica, but I'm loving it. And about Oprah being able to leave him naked and all that, that's a huge load of crap. Oprah is overrated. The group apologised for the publicity stunt (and that's what it was, really) seeing the amount of publicity the book generated. paulmitchell, love your repeated use of "whatever". And interested to see that you don't take the authors' views (noted in a comment above) into account. Do post the table of contents if you feel up to it mate. Would you care to be turned towards the light? Do you need some fresh soil, or some pruning? I only ask because to any outside observer you strongly appear to be a plant. Mr Whatever, the stories you are accessing for "free" on the internet are in all probability (certainly in the case of Guernica) materials for which the authors have been paid. The fact that YOU don't have to pay doesn't mean that the work has been stolen, or that even that the authors have given it away (which we sometimes choose to do -- but we like to make that choice ourselves). Publishers, websites, NGOs, corporates, cultural initiatives etc all pay artists for the work they might then disseminate for free, usually as a marketing tool. In other words, there's a big difference between a free giveaway (kinda like a supermarket sample) and shop-lifting. Does anyone want to take bets on Oprah's lawyers being satisfied with "sorry, it was just a publicity stunt"? You are a thief and, as has already been proven, a compulsive liar. While those stories might have appeared on the internet for free, it's becoming painfully obvious that few, if any, of the stories in this book were published with the their permission. I publish the large majority of my work online, for free. That does not mean you have the right to take it and sell it. If you're confused about this, you need to take a basic course on ethics. I'd strongly consider changing your name if you ever consider actually working with any authors or publishing companies in the future as you've effectively made it, mud. And something I sincerely doubt anyone involved in literature in Africa wants to be involved or associated with, ever. Why is the table of contents not available at Amazon? It's customary to post a ToC. Paul, can you provide the ToC please? As Rustum kindly reminded me, the correct (and brilliant) Internet term for such, being a fake user set up to corroborate your argument, is sockpuppet. And as Sam Wilson pointed out on Twitter, Mfonobong's tweets, by total coincidence I'm sure, happen to use the word "whatever" quite prevalently. I would be absolutely horrified if I posted a piece of writing online and someone just used it without my permission. I would do everything in my power to have my unauthorised contribution removed from the offending collection and to make it known that the person responsible had no right to use my work. The book is on Goodreads and apparently features work by Chimamanda Ngozi Adichie, Wole Soyinka, Chika Unigwe. I wonder if they agreed to this. I'm actually a little sad that I haven't been included in the collection. Does that make me a sockpuppet? StoryAfrica I believe to have been founded only in April 2010 (according to the information provided on the anthology's page at Amazon), and an anthology out in May. The people at StoryAfrica must be superhuman, getting permissions and all within such a short time. Hey People. Let me comment on all that has been said. We meant no evil. Sincerely. We just wanted to sell African literature to the world. I was just in charge of the project. I regret that you are all so angry about this. We will cancel the project. We are sorry. But I maintain that it was not a scam. It was a project motivated by good intentions. Unfortunately I went about it the wrong way. But we have contacted the publisher to take it down. If you have any questions, ask me. I don't know, Rustum. It got a five-star review from Heidi Mueller of San Francisco. And it clearly says that's her "real name". I'm inclined to give this the benefit of the doubt. Much like I did with Jade Williams. But @ pleasefindthis- be careful what you say. You don't know me and you shouldn't call me names. Cheers. I don't have to do anything to your name, you've done all the hard work yourself. @pleasefindthis, you have a point. Seriously now, very seriously, brinhow do we apologize to the world? I don't know who's bringing all this up, but we really got permission from all the authors in the book. The only man who we wrote to, and who didn't reply us was Mr. EC Osondu, whom I suspect is behind all this. But, we have cancelled the project. As for the false marketing tactics (what moi calls guerilla marketing), we are truly sorry. We could have apologized to Oprah, but she doesn't even know about this stuff. To E.C Osondu (who is my facebook friend), we're sorry. The links in that press room are amazing. It's worth another article on its own. The list of people who will probably now sue, so far (taking into account this article and the other links) ranges from Oprah, to Linkin Park, to Donald Trump, to U2. I sincerely doubt Mr. EC Osondu is in the crowd busy watching this right now. The reason people are "bringing this all up" is because it's offensive to writers, to readers and anyone with an ethical or moral bone in their body. "Guerrilla marketing" is putting an ad for your book up in the bathroom of an African themed restaurant or putting leaflets on the seats of a theater showing the Lion King. And, finally, if you really do have permission from all the authors, why are you pulling the project? Just tell us all to shut-up by simply posting the correspondence indicating their permission for you to publish this, much in the same way that Ben, the editor has published his letter from one of your authors who categorically states that he <i>didn't</i> give you permission to publish any of his work. "...rigorous selection process by a panel of over 20 literary scholars and professors in Harvard, Columbia and Yale..."
StoryAfrica might need to do some backtracking there, too. Just a thought. surely you could just drop the one author, repaginate the document and still publish the project? Why fold so easily? I'd still like to see the ToC. Can't you upload a scan? Are those the names of townships in Kenya? Ben, Rustum is hot on your heels as a Newshound of Note. This would all be highly entertaining if it wasn't illegal. I found this most informative tidbit in the press room, and am posting it for the benefit of Ms Winfrey et al's lawyers: "Hodderway Group is an emerging media conglomerate. Right now, our interests are tied to publishing and general writing services. We are on our way to becoming a Pan- African media and communications powerhouse." "This is not and should not be allowed to go away for Mr. Nsehe. Please google his name and you'll see his pawmarks all over all kinds of schemes/scams/ventures and misadventures. He is apparently still selling this book and should be shamed into ceasing and desisting. I will be happy to give him the name of my literay agents so he can make out a check for the Red Cross from me." I've just discovered, to my horror, that I am in this anthology. I have just blogged about it. Mfonobong Nsehe, your actions are a disgrace to the literary community, this is clearly fraudulent behaviour and no amount of apologising will clear that! Do you know the only thing that a writer/ publisher has in the writing world, that is more precious than anything else? It is INTEGRITY. Without it, you have NOTHING. That is the hallmark of great writing and great publishing. Stop with the excuses and try something better, these authors who have been mentioned who are in your publication have the greatest integrity, values and utmost respect for the literary halls. By making fraudulent claims to Oprah's Book Club and publishing without permission, you have done nothing but smear their names in cheap disgrace, which no writer needs. You want to do something big for African Literature? Then do it RIGHT. You have done nothing but disgrace yourself and abuse the writers you purport to promote, who really don't need such cheap and fraudulent promotion schemes. As a writer, I am simply flabbergasted and infuriated by your nerve. Help such as yours, the literary community certainly does not need. And I hope people stop buying your book. It is nothing but disgrace. And paulmitchell, you are obviously not a writer because if you were, you would understand just how much copyright means to the writer, just how disgraceful and infuriating theft of intellectual property is. The idea of the anthology may be noble but, clearly, those behind have a long way to go before they get anywhere near being 'noble'. The malady lingers, in fact, deepens. The post facto scramble for permissions (see the letter on Molara Wood's blog) requires further suspension of disbelief: an unnamed permissions manager who lied about her task. It seems then that more than one author did not grant permission, as opposed to only one (as claimed by StoryAfrica in a comment above, and who may or may not be Mr. Nsehe and/or Paul Mitchell). Molara, thanks for writing in. And thanks for keeping up with the story, all. "And by the way, while I am truly very sorry on behalf of the team and must exercise caution and respect in writing to you, I just want you to know that the thing you said about sales picking up in 2050 is absolute crap. Sales have actually been good. Target and Walmart, apparently, are selling the book, and we've already sold in thousands in less than 6 weeks. Smaller publishers in America and Canada have already requested for republishing rights..."
so... MN is about to sell/confer republishing rights to property he don't own? Is that like selling/giving away farms on the moon? Or is it like selling/giving away fake Nike? Or is it like selling/giving away your brother's cellphone you stole? 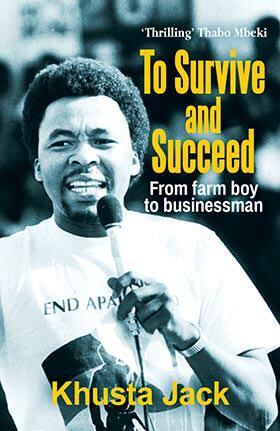 Mmm, looks like a lawsuit if indeed the book is selling (I thought Mr Nsehe was going to can the thing after the BookSA expose). MW, he says the book has been selling in the thousands - ?! That changes the ballgame a bit. I think you or someone else illegally included in the collection should contact Amazon directly to shut the operation down. Hi, Just seen this. I'm a writer from Kenya and I know the Kenyan writers who allegedly participated. My two-cents' worth: It's probably none of my business, but I like to get paid when my stuff is sold. Reason: Writing is pretty tough work, and writers should be treated with respect. I hope this thing is genuine, and that the writers involved gave their consent. If you've ever seen someone selling a counterfeit copy of your book at a street corner then you will understand how I feel. Amen! Molara, it's okay. Take it easy. It seems like you both are angry. I wish you too could meet up sometime and clash. It'll be awesome. But I don't think he's not a bad guy, plus I think he had noble intentions- just went about it the wrong way. He has apologhised. Try and be a forgiving sweetheart. I think he's also a writer, and has even won international awards for his work : I searched his name on ask.com and saw this: http://www.oslocoalition.org/html/project_school_education/Stories_Competition.htm and http://folk.uio.no/leirvik/OsloCoalition/storiesontolerance.htm. I wish you'll write more stories on your blog. Fantastic link, Sam, thanks for including it in the thread. Molara's posts seem to have disappeared - am working on that. I've just written to Chika and EC to alert them of this, if they haven't been alerted yet ... will be interesting to hear their responses. How ironic that one of the stories in the 'anthology' is called 'Stolen'. I feel terrible for all of these abused authors. What an awful experience. Hopefully somebody will be able to stop this fraudster soon. Ok, Molara's comments are restored. MW, if you have any trouble posting further comments, please send me a note at editor _at_ book _dot_ co _dot_ za. Thanks. .. and it seems the big guns on that contents list are well alerted, pissed off and working to get the book pulled from Amazon. Sockpuppet "Wali Akande" is also dragging down the very good name of Ushahidi by pretending to be associated with it. that's amazing moi, great resource. thank you. This is the most fascinating, horrifying and amusing post I've read in a very long time. Sam Wilson's plant chirp caused me, unwittingly, to explode with mirth all over the keyboard and the cottage, causing untold concern and psychological distress to the landlady and her husband. Most of you will not be surprised to find out that i found out about this scam today. I was told by a fellow writer whose works are in the book itself. Let's see. I think i want to laugh. Yes. I feel like laughing. Hahahaha! I knew it felt all too easy. I should have known. I should have been smarter. But for now. I laugh at my folly. As for Mfonobong Udo, i do not support some of his actions like endorsing Oprah, but beyond that, he and i are cool. I'm also from Daystar and i schooled with him. So my trust and faith in him as a friend hasn't dwindled. The hate blog and the hate speech were a different, rather moronically loyal way of his friends to react in light of Mfon's accusations. They too were hurt and surprised, but unlike laughing like i did, they went ahead to speak foul things that they deemed truthful. Again, i find it rather sad. Especially for the writers who got mixed up in this. I do. Hopefully, God will compensate them and even bless them with a greater inspiration that can only come from him for their works. I'll keep on blogging and writing my works and all will be well with me. Mfon, be strong. Your true friends have your back. Before the rest of you finish casting your large store of stones, i suggest that you be objective. Weigh what every party involved in this has said, and then choose your reaction. I would suggest laughing. Life is too short and beautiful to get yourselves mixed up in things beyond your control. Call it free-spirited and silly, but that's how i live. The real perpetrators shall hopefully be prosecuted and whole the truth will out, and everything will hopefully be well in due time. For now, back to blogging, brunch and taking life one step at a time. Pretty much. The first 2 are mine though. Enjoy. Live and let live people. Life's too short. Can't say that enough! Keep flicking the Bic! I guess Google's alerting service is like clicking a Bic lighter, from that old SA tv ad, of which your 'well-spotted' reminded me. I wonder if MN writ this unattributed piece here? you plunk in a para or three, press the button and get a report on the websites in which various chunks of the text also appears.